12 Apps – On 12:12:12 – to Make Your Time on the Water Great! 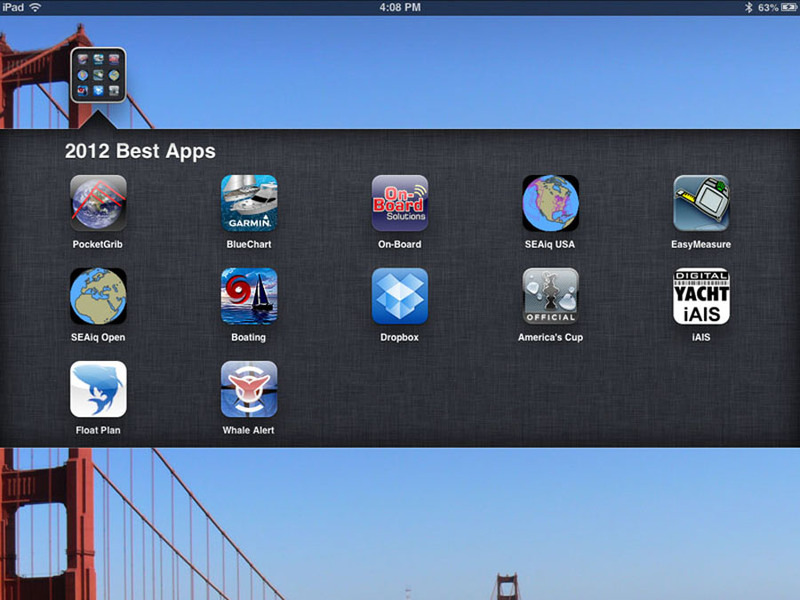 It seems like there are five times as many apps for boating enthusiasts than there were when I wrote my first annual “Best Boating Apps” review, back in 2009. Boaters are catching the wave and diving into the App Store for everything from navigation & charting to basic communications apps for their iPads, and Apple says that they’ve sold over 100 million of them since they first hit the market. With over 12,175,900 registered vessels in the U.S. alone, I wouldn’t be surprised to find that a few million boaters now use a mobile device of some kind. Fortunately for those who have climbed onboard the mobile tech boat, there are some terrific new apps ready to make boating even more fun and safe. The biggest change over the past year for handheld devices is the number of apps now available that connect to NMEA data via WiFi and TCIP. Which reminds me of the top question readers ask me, “How can I interface my boats’ systems to my iPad?” Some great news for the techie-types who want to virtually “run” their boat from the palm of their hand. Many developers like Digital Yachts, Zapf, Ocean Equipment and ShipModul, have brought this capability to the world of iOS, thereby allowing data from instruments like wind and speed, as well as AIS and radar to be streamed to a laptop over WLAN or over WiFi to an iOS device. Note: You must have a device (such as Digital Yacht’s iAIS or SeaMate1A) that will get your NMEA data from your boat’s network to your various i-devices. But the good news is that it’s getting easier to integrate and the new apps are really well designed. 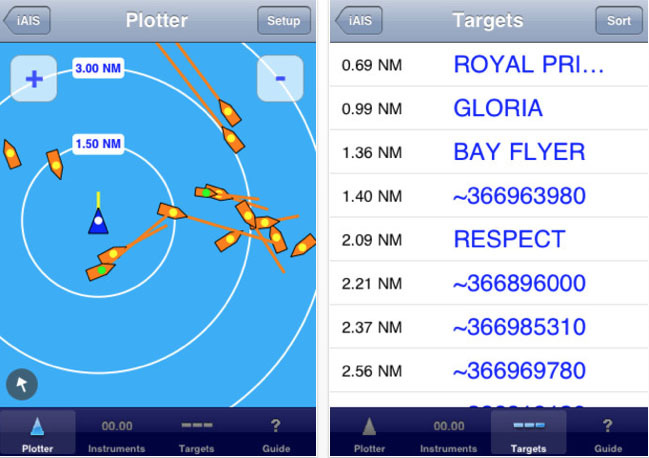 Just released in November 2012, BlueChart Mobile is the next level of Charting for boaters with iPads. It does what most of the top Nav apps do, like use the same BlueChart data available for Garmin chartplotters right on your iPad, but that’s where the similarities end and the amazing design takes you on a whole new voyage to charting heaven. The first big new element is the download interface. With BlueChart Mobile, once you’ve got your chart (via the easy in-app purchase), you’re offered a large-scale view of the area (say North America), with a simple grid overlay. By clicking on a specific box you can choose which areas to download—a great space-saver for your device. Zoom into to see chart features and overlays for weather conditions, (temps, wind direction/speed) grib info and ActiveCaptain content overlaid on the chart data. One drawback: The new Garmin app does not support NMEA or AIS or any of the WiFi units mentioned here. Plus, you’ll have to buy iPad charts even though you may already have charts for your Garmin chart plotter. BlueChart Mobile has ActiveCaptain inside! For those of you not already using it, ActiveCaptain is a web community that provides real-time content generated by mariners, for mariners. It’s a virtual cruising guide that never goes out of date. 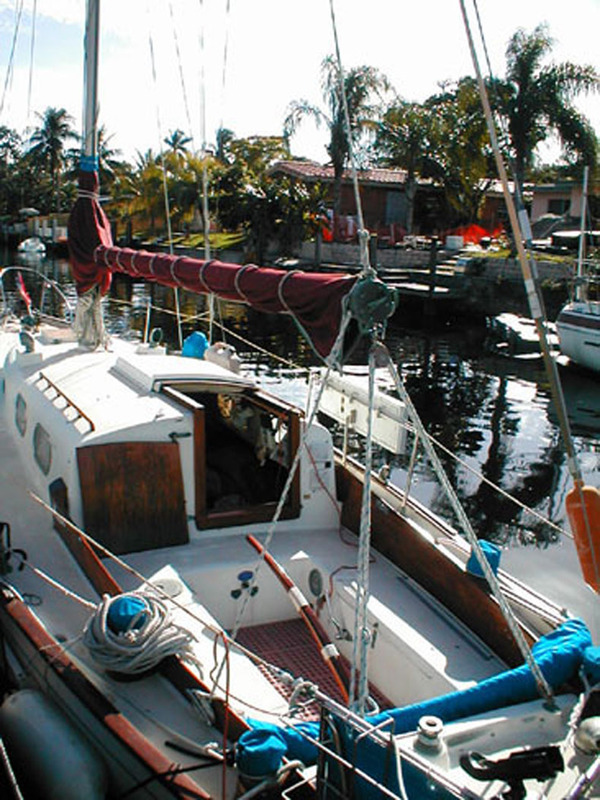 Read and write reviews about marinas, local boating knowledge, anchorages and hazards. More than 100,000 boaters write reviews and update the information on ActiveCaptain—with more users joining all the time. Best Feature: It’s seriously difficult to pick just one favorite feature on this terrific app, but it may just be the cool info wheels that pop-up when you click on any icon from the ActiveCaptain overlay or hazard. It’s just a really fun interface! If you’re lucky enough to have Raymarine electronics onboard you’ll want to have this handy app on your iPad that lets you display everything from you e-Series or c-Series Multi-function Display (v 315 or later). Even better than RayView, RayControl puts your iPad in the driver’s seat. Use it just as you would your Multi-function Display, with touch screen interaction and a virtual slide-out MFD keypad. Chart plotting, depth/Fishfinder, engine systems, radar, even view video from any installed cameras. Uses onboard WiFi network. What makes one Nav app stand apart from all the others? In the case of the new SEAiq, it’s the ability to view always up-to-date vector charts of the USA; however the free versions do limit you to only displaying charts of scales greater than 1:50,000 until you purchase the upgrade. Vector charts offer more detail and faster scrolling than Raster. SEAiq Open is unique for allowing users to install their own charts, including S-57, S-63, and CM93 charts, which means that you don’t have to purchase the same charts you’ve already bought a few times over. Though the interface is less than ideal (transfer chart files via iTunes), it is another great benefit not found in other nav apps. You’ll need a fast connection to set it up the first time. SEAiq Free and SEAiq Open are among the few navigation apps with a useful free version. All the versions offer some good bells & whistles including ActiveCaptain, WiFi NMEA, AIS, and night color modes. You’ll need a fast connection for the set up. I found it took quite some time to download charts or transfer ActiveCaptain data and wished that it could have done it in the background while I went on with other things. Best Feature: ActiveCaptain interface and support of external NMEA/AIS over WiFi. In fact, according to the creator of SEAiq Mark Hayden (a sailor and delivery captain), it is the ONLY charting app of those reviewed here that supports NMEA and AIS over WiFi and TCP. “The SEAiq AIS is good enough that professional pilots that board 1000ft freighters use it,” says Mark. It used to be that your ship’s library held all your various manuals, cruising guides and any “fun” reading took up whatever space remained. Thank goodness that ONboard came to the rescue with a great app that organizes all your boating-related reading into one really small digital space. On-Board gives you the ability to integrate and display your boat’s documents, photos, videos- both personal and from your yacht’s manufacturer, dealer or mechanic. Get real time info from your boat’s manufacturer. Need to search for how to prime your fuel system? You can search your manuals and find it fast. Manage all your important records like maintenance, registration, insurance, financing, warranties and claims. Plus you can even manage your online subscriptions to your favorite boating pub right from the app. Best Feature: Getting your own unique email address at yourname@yacht.com! This is the newest AIS plotter in the App Store and it’s by a UK company that seems to be putting out some pretty good onboard interface apps. AIS is great for anyone boating in crowded areas or for those curious about who’s out there. Any vessel that has a registered AIS device will show up with their name, vessel details, course, speed and direction which can be helpful when you’re in high-traffic anchorages or bays. Best Feature: iAIS also can be used as an overlay with iNavX. Now that’s handy! Everyone responsible boater knows that it’s always prudent to file a Float Plan before you depart on your trip no matter how long you expect to be out. This new app, which runs on most Apple & Android devices, will save you time due to the easy interface and ability to email a pre-filled plan to anyone you choose. Though, I found it a little clumsy in my test of the app, specifically when trying to check off selections in lists like Safety gear. One improvement would be to have a default save New Trip, so you don’t have to check that (something I didn’t see until it was too late!). 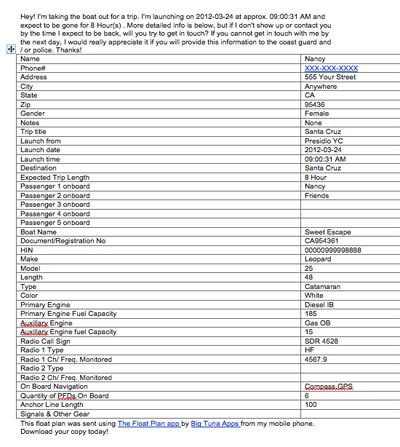 A sample floatplan that can be sent via email to your list. It’s one thing to be able to get good weather info while you’re out there on your boat, but knowing how to interpret that info is an entirely different thing. With PocketGrib you can access, view and analyze global weather data (with a connection of course) and then display that info even when you’re offline. See wind speed, direction, precip, air temp, waves, current, and forecasts. Grib data is supplied by NOAA’s GFS model and is updated 4 times per day or every 6 hours. Best feature: GRIB files can be downloaded to your PC via iTunes, which means that if you’re cruising with a personal forecaster service, you can view your Gribs using PocketGrib! Best Feature: This app is very well designed, easy to use and super fast. It now easy to get the best weather info right on your chart with Intellicasts’ Boating for iPhone/iPad. 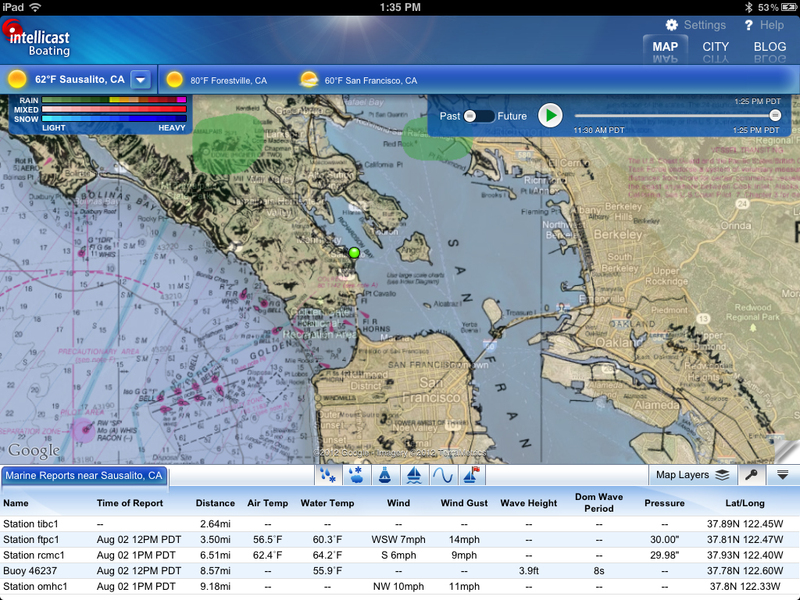 Integrates NOAA nav charts with advanced meteorological data just like their website offers. Lots of overlay options from Radar to Satellite, Wind Speed to Temps, and NWS Marine Forecasts (Offshore) and Tides. Even track Hurricanes. Best Feature: Very handy and easy to see on the iPad’s retina display. Note: a cellular or WiFi connection is needed. Not too many years ago, you either had to take your laptop with you ashore to send or receive email or better yet, take a tiny thumb drive, like we did in remote ports in Baja. Now there’s Dropbox. This handy app runs on any device and allows you to keep files of any kind in the “cloud.” That way you can access them from anywhere, either via the app or via your account on their website. The free account comes with 2GB of storage which you can add to by inviting others to join by sharing your files with them. The more you share, the more free space they give you. Or you can get a Pro plan starting at $9.99 for 100MB. Once you download those files, your space is freed up for more! Just in time for the 2013 finals! The app gives you the latest news, event schedules and great videos. Enjoy the races anytime using the Virtual Eye 3D viewer including historical races. Listen to live commentary and onboard audio feeds streamed directly from the racing yachts when the finals start up in August/September. In the meantime, you can follow along as the teams wreck (er, I mean – race!) their yachts in practice events. 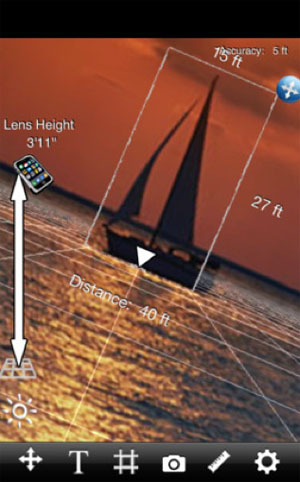 Easily measure the distance from your stern to that yacht that anchored right on top of you! Uses your iPhone’s camera to measure with a great 3D grid overlay. Just set up once (an easy task) and measure away! (Also a great golf aid). You may have noticed more news about whales trying to jump on boats or boats running into whales. As more of us venture out into their world, chances of running into them increase. Now there’s even an app for avoiding whales by the good folks at EarthNC (makers of Marine Charts with ActiveCaptain!). Whale Alert was designed to assist in the management of right whale conservation areas and to help reporting in shipping lanes in and around Stellwagen Bank National Marine Sanctuary. Whale Alert can help reduce the likelihood of ships colliding with these endangered whales, which can injure or kill them. It is not meant to be used alone but to compliment existing protective measures. 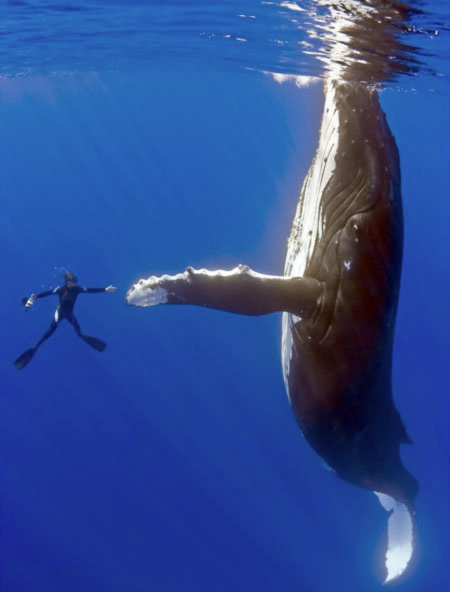 Whale Alert is the first mobile application to take advantage of the transmission of environmental data over the AIS protocol. 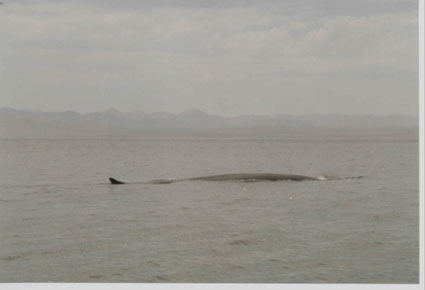 The system takes DMA and real-time right whale observations and displays that data graphically, directly within the app. Tell us your favorite Boating App! Like us on Twitter. Happy Summer Solstice from YourCruisingEditor! Happy Summer Solstice to all my fellow cruisers! Sail on! In honor of the Solstice I thought I’d reminisce a little about our cruise. I’ve picked a log entry from this time – waaaay back in 2000 as well as some photos. We were still sailing the Sea of Cortez and were enjoying our last sail before putting SAGA (our 1964 Alberg 35) on the hard for a trip to Jeff City, MO to help my sister Deb recover from a knee replacement. 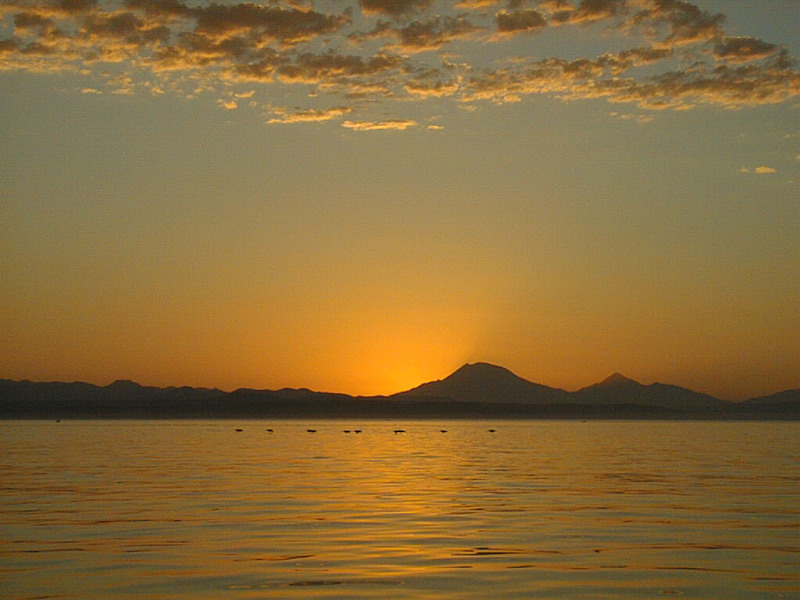 June 22, 2000 – San Carlos, Sonora, Mex. 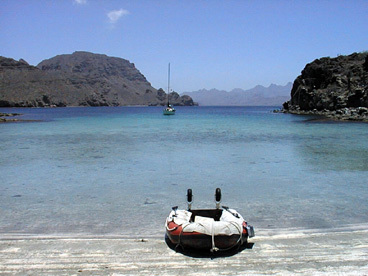 Jann & I are in the final process of preparing the boat for three months dry storage in Marina Seca, San Carlos. 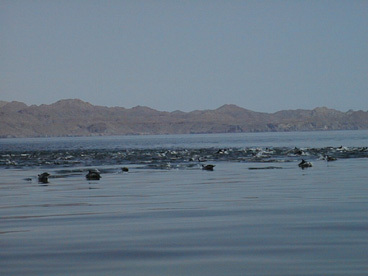 We made the crossing from Santa Rosalia on the Baja side just over a week ago and from the stories we’ve been hearing, we had a good crossing. Most of the boats that left after us got into some nasty wind and waves. As it was, we chose a detour half way across when we heard that our friends from San Diego on ‘Tauranga‘ were anchored in a cove 17 nm north of San Carlos. We altered course and headed into Bahia San Pedro to play for a day or so before the decommissioning! We left three days later due to the same winds that were breaking stuff on other boats making the crossing. 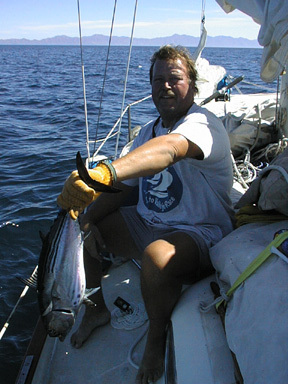 Finally, as the seas began to lay down, at 0630, we stuck our nose out of the anchorage and said, “On second thought, let’s wait some more!” ‘Tauranga‘ pulled out around midday, but they have 52 feet & much more freeboard than our SAGA. So we waited until we saw a shift in the winds and then made a break for it around 1500. It calmed even more as we approached San Carlos, but by that time, it was already getting dark and even under a post-solstice full moon, we were having trouble seeing our way into the harbor. Add to that, there were no navigation lights lit up on the rocks. So we hailed ‘Tauranga‘ and Marc (sweetie that he is), came out in his dinghy and lead us into the harbor with a flashlight! Thanks to Marc and Teri on the lovely ‘Tauranga‘ for feeding us in San Pedro cove, and LOBSTER too! Mighty nice to see them again. It is REALLY HOT HERE! Definitely up in the three-digits, and it stays hot after sundown. After all, it is the Sonoran Desert! Fortunately, many businesses and restaurants have air-conditioning, unlike SAGA. The boat is almost ready to haul. 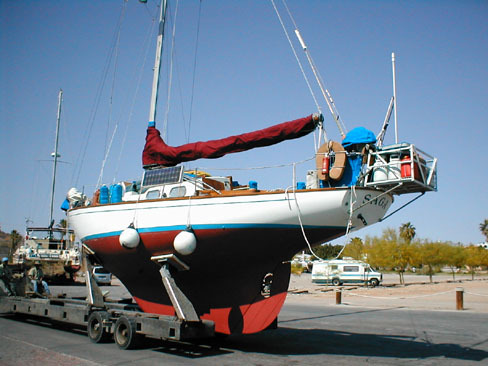 It’s an amazing feat, watching them haul a full-keel sailboat out of the water without a lift. They make it look so easy with their trailer with the padded hydraulic lifts. They bring the boat as far up to the boat launch that the high tide will allow and back the trailer under it. Then they carefully raise the boat, haul it out and pull it down the highway a mile or so to the dry storage yard, (called appropriately enough – Marina Seca!). We even got to ride onboard SAGA for the trip there. They can move a boat up to 60′. SAGA anchored at Isla Danzante - an anchorage to ourselves! 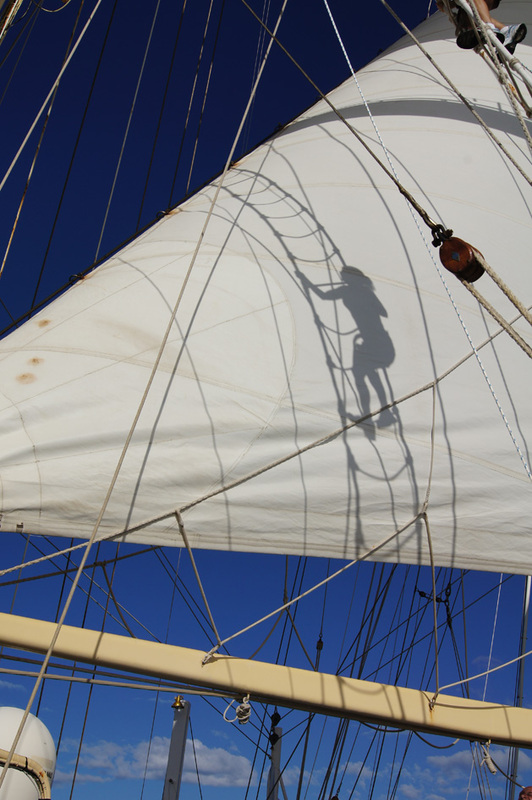 Don’t forget to celebrate the Summer Solstice and Sailstice by going sailing! 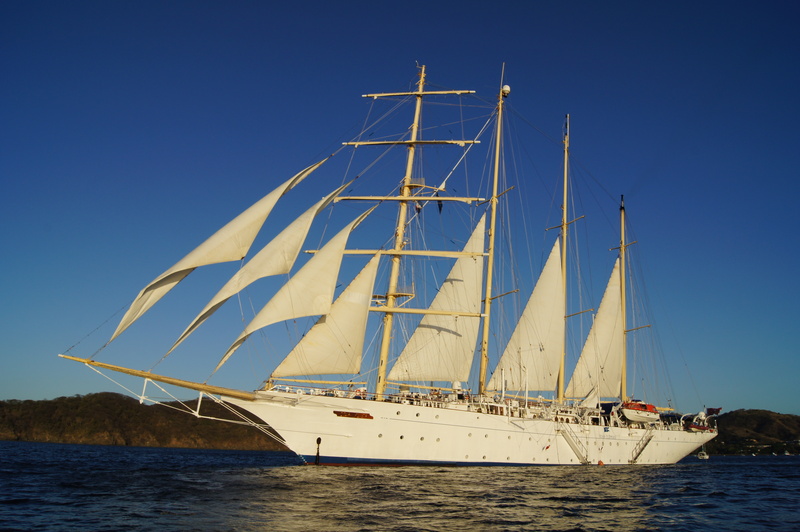 If you dream of adventure sailing on a tall ship through the wilds of Central America, anchoring in pristine coves filled with dolphins, whales and birds not other boats or cruise ships, then you need to book a cruise with Star Clipper Cruises. 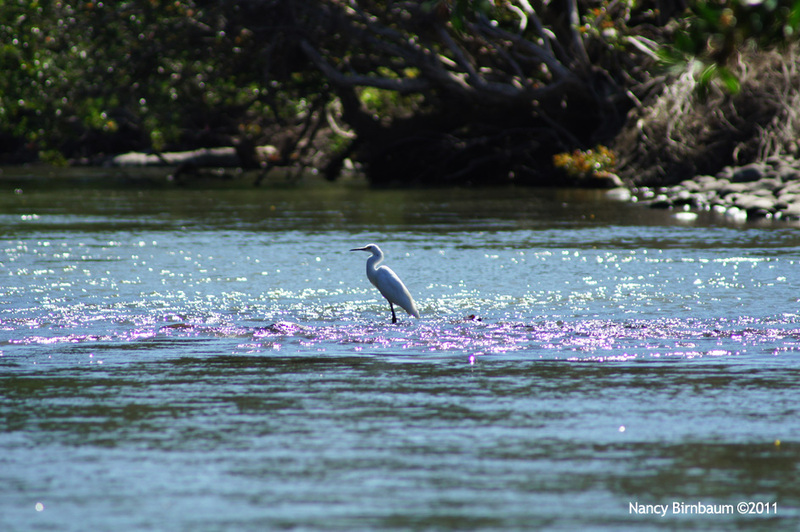 Join in a rare adventure of nature unbounded – cruising both Nicaragua and Costa Rica or Panama and Costa Rica itineraries. Clearly this is not a cruise ship in the ordinary sense. Star Flyer, like it’s sister ship, the Star Clipper, is a true clipper ship reflecting her proud heritage in every inch of her polished brass and gleaming brightwork. Once onboard you’ll discover a new age of sail, where the traditions of the past are happily married to the comforts and amenities of the present day. Star Clipper and Star Flyer are modern cruise ships in every way, created for luxury-loving passengers who also love the traditions and romance of the legendary era of sailing ships. Star Clipper and Star Flyer are both 360 feet long and each carries just 170 guests in pampered comfort. Don’t miss out on this new cruising ground. 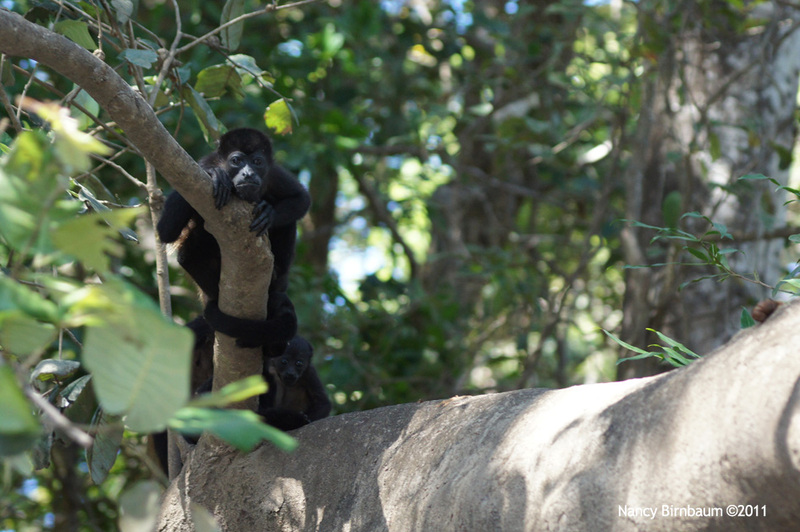 Check out their new Panama Itinerary today! 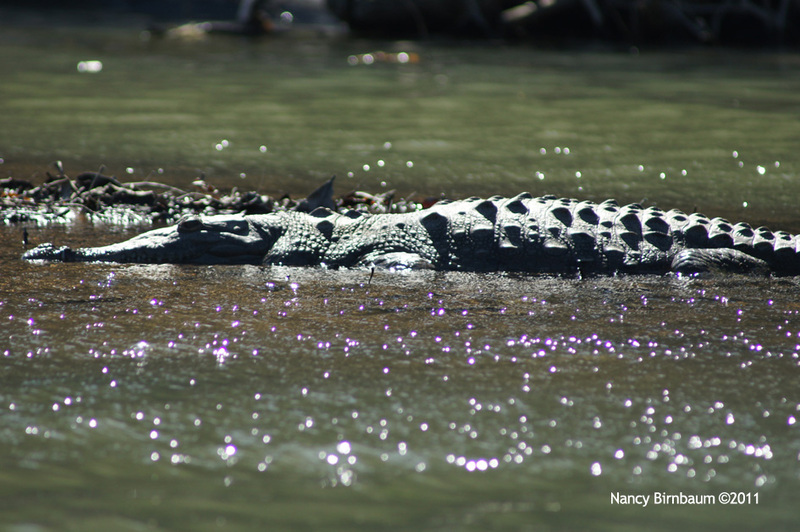 Costa Rica and San Juan del Sur, Nicaragua Cruises run 7-nights. 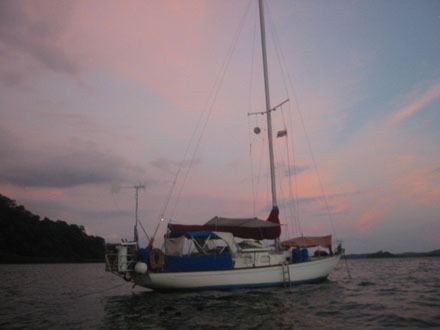 Next sailing dates: February 13 or February 27, 2011. Rates start at $1,943 ppdo.